Everyone wishes for a life that is completely free of problems and is full of prosperity, success & joy! However, there comes a time in the life of some people when misfortune strikes, leaving their morale completely shattered and making their life utterly miserable. So what should such people do, in order get out of their miseries? The answer to that question is - "Navchandi Puja" Navchandi Puja is a holy ritual of worship (Puja) of the Nine Avataars/Incarnations of Goddess Durga which are known as Navchandi. It is said in the holy texts that- one who pleases the Navchandi and receives their blessings, gets abundant wealth, a sound health and protection from all enemies in life. With the blessings of Navchandi, one lives a life full of bliss & prosperity. There is no hurdle or obstacle that cannot be removed from the life path of an individual with the blessings of Navchandi. By performing Navchandi Puja, one can witness unbelievable positive changes in his/her life that would lead to a life full of happiness & joy. Therefore we urge you to book a Navchandi Puja for yourself, to receive the blessings of all the Nine Avataars of Goddess Durga and make prosperity, wealth, bliss and health, a living reality in your life! Navchandi Puja protects an individual from all enemies (both open and hidden) and makes him/her emerge victorious over all enemies. Navchandi Puja blesses a person with mental peace and harmony in family relations. Students get enhanced focus & concentration that brings success in their educational career by receiving the blessings of the Nine Avataars of Goddess Durga from Navchandi Puja. Navchandi Puja shields an individual from malefic & negative energies, by creating a protective aura around him/her. Navchandi Puja dispels all fears from life. Navchandi Puja provides the individual with enormous growth opportunities and propels the individual to scale new heights in his/her professional life. Navchandi Puja blesses the individual with an enhanced ability of perception which makes him/her identify the right gainful prospects, at the right time in life. Navchandi Puja brings abundant fortune & luck in the life of the native. Navchandi Puja blesses the native with a sound health and protects from ailments that are slated to appear in the future. 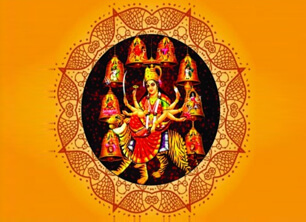 Navchandi Puja blesses the individual with a beneficial property and brings the individual out of any disputes or legal hurdles revolving around property. Navchandi Puja also promotes chances of gainful travels in one's life, both foreign and domestic. Navchandi Puja raises the business of an individual to a whole new level and blesses the individual with great gains/profits in business. Navchandi Puja provides financial abundance and security to people in both job and business sectors. Navchandi Puja, on your behalf by highly learned Brahmin Priests to bring forth the divine blessings of the Navchandi Avataars of Goddess Durga in your life. Note: The Navchandi Puja is performed in strict accordance with all Vedic rules & rituals as prescribed in the Holy Scriptures. Why should I go for Navchandi Puja? Navchandi Puja is the holy ritual of worshipping the Nine Avataars of Goddess Durga that give abundant prosperity and protection from evil to devotees. Therefore, the blessings of Navchandi are a must to lead a life that would become a manifestation of joy & happiness. So, go for this life altering ritual! Who will perform the Navchandi Puja? Absolutely, you can watch the Navchandi Puja being performed in your name via a recording provided to you by us. Is there any minimum age to go for Navchandi Puja? No. Anyone can go for this Navchandi Puja. Can I book the Navchandi Puja for someone else in my family? Absolutely! What better gift can you give to your near and dear ones, than making sure that they get the powerful blessings of Navchandi - the Nine Avataars of Goddess Durga!